​There are, I suppose, all kinds of people, based on what area they like to play in. There are City People, there are Beach People and there are Mountain People. Probably many others as well. My wife and I are confirmed Mountain People. Our best vacations usually occur high in the Rockies, with cold mornings, pine trees everywhere, and a distinct lack of Wi-Fi or even basic cell coverage. This year, we designated the month of August to be shivering in Glacier National Park, then Yellowstone. 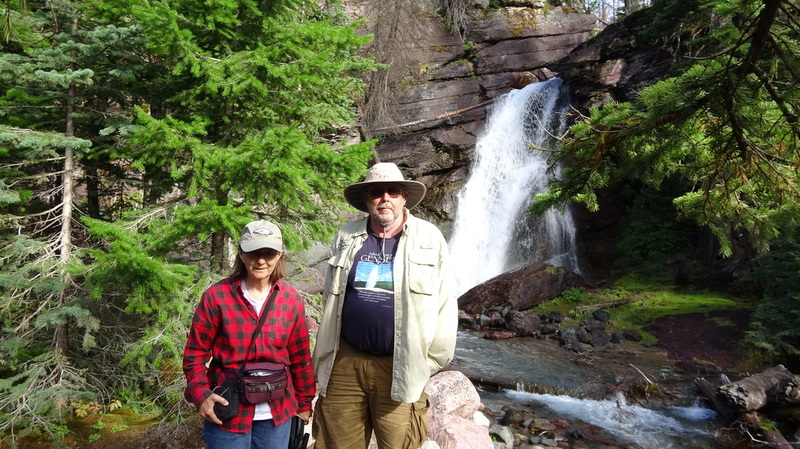 I had not been to Glacier since the mid 1960’s, and my wife had never been there. Early this year, we got reservations for Johnson’s RV park, in St. Mary, Montana. There are many campgrounds available within Glacier’s boundaries, but these are more primitive sites, with no RV utility connections. In our decrepitude, we have gotten used to those creature comforts like electricity and running water. Johnson’s has both full hookups and, with its hilltop location, also treats you to a spectacular view of the Glacier area. It has a view, from many of the sites, that causes people to drag chairs outside, just to gaze. As with many other RV parks, it has limited Wi-Fi access. Glacier has two main entrances, on the east and west sides. Gateway communities on the east side are St. Mary, Montana and East Glacier, Montana. On the west side is West Glacier, Montana and nearby Kalispell, Montana. The east and west sides of the park are very different in climate and available amenities. In general, the west side has more amenities, and a much more temperate climate . . . well, more temperate for northern Montana, at least. Pacific fronts bring in warmer temperatures and moisture. In addition, only the west entrance to the park is open year-round. If it makes any difference, only the west side is served by cable TV and true high speed internet. In many ways, the western areas of the park sometimes more closely resemble a coastal rain forest than classic Rocky Mountain high country. The east side is much more arid, mainly caused by the high winds that sweep the area. While services are available on the west side of the park year-round, winter services on the east side are limited to nonexistent. TV and internet services on the east side are provided by satellite. Several roads plunge into Glacier’s interior, but only one high road cuts completely across Glacier’s width, from east to west: Going-to-the-Sun Highway. This 50-mile engineering marvel took 12 years to build across the park, and presents the driver with spectacular scenery at every turn – and there are a lot of turns. In addition, there are places where the road is narrow and may have rock above overhanging the road. Travel across this highway is restricted to vehicles under 21 feet in total length, under 8 feet wide, and under 10 feet tall. This eliminates most motor homes and trailers. Drivers of large pickup trucks are advised to retract their mirrors to prevent unpleasantries with oncoming traffic or nearby rock formations. The highway also attracts film makers: During his running phase, Forrest Gump galloped along Going-to-the-Sun Highway. Each spring, the road must be opened by snowplow, moving snow up to 80 feet deep in some places, clearing – in the worst areas – as little as 500 feet per day. The highest point the road reaches is 6,646 feet (2,026 m) at Logan Pass. Numerous hiking trails fan out from Logan Pass, and there is a visitor center, a gift shop, and rest rooms there. There is a large parking area there, but it is never large enough. Not only is there not enough room for parking: if you want to cruise the aisles looking for a space to open up, you have to wait your turn for that, too. The root of the parking problem is that the scenery is so vertical, there are very few flat places to put parking lots. Check the schedules for the shuttle buses to avoid the jammed-up parking lot. While we were at Logan Pass, we saw two restored antique touring coaches carrying people up the highway. Several dead-end roads also lead to many of the other areas of the park: The Many Glacier/Swiftcurrent area, the Two Medicine area, and the northwest corner of the park (Polebridge and Bowman Lake areas). Besides sightseeing in the mountains, Glacier is very much a hiker’s park. Trails can lead to glaciers, lakes, waterfalls, or even a wilderness chalet or two. Two back-country chalets cater to tourists – well, those that have reserved a place to sleep many months in advance, and don’t mind paying over $100 a person to spend a night in a sparse room, sleeping in their own sleeping bags. This would be only after a seven to ten mile hike to the chalet: Granite Park Chalet and Sperry Chalet. There are many books and websites that offer information about Glacier’s trails. One that was very useful in our plans was hikinginglacier.com, which allows users to select trails based on length, degree of difficulty, or type of destination. 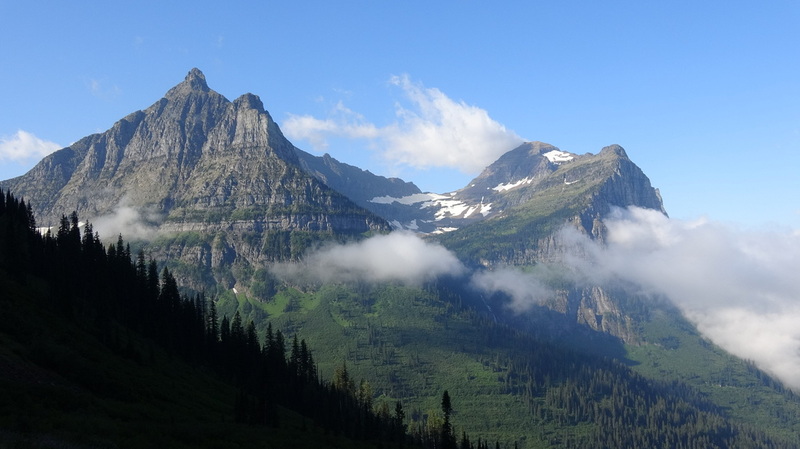 As far as planning a hike goes, Glacier has some special considerations. Parking areas around the trail heads – or other attractions, for that matter – have limited spaces available. If you want to be sure of being able to do a particular hike, either arrive early – very early – for a parking space, or take one of the shuttle buses to the trail head. Not all trails are served by shuttles, though. One other hikers’ consideration in Glacier is bears. In general, bears will move out of hikers’ way if they know that the hikers are coming. A very good way to avoid bear encounters is to make enough noise to alert a bear that hikers are near. Bear bells, and other trail noisemakers have been used for many years to avoid surprising a bear in the back country. Even a chatty, loud-talking hiking partner may be enough; when I hiked alone in Yellowstone many years ago, I would hike with a small portable tape player playing rock music. Bear spray is now recommended for all hikers. This relatively recent invention is essentially a “super-mace”, is intended to discourage a charging bear. The spray, like mace, results in extreme irritation of the nose and nasal areas, the eyes, the mouth, and the throat. This discouragement is so severe that a sprayed bear may later have trouble locating its natural foods for many days. Hikers are now being cautioned to only use the spray if a bear is acting threatening, and do not spray simply because they see a bear. In most of the hikers and hiking groups we saw, at least one person carried bear spray in a holster. On one trail, my wife and I saw one man carrying a pistol in a hip holster. Carrying pistols on trails in national parks is now legal, as long as the person carrying the firearm has a valid carry permit from his or her home state. However, the Park Service emphasizes that bear spray is a better alternative than firearms for most bear encounters. First, unless you’re a trained cop, it’s unlikely you could draw, aim, and hit a charging bear before it is on top of you. Second, the majority of pistol calibers will not have the power to stop a charging grizzly, assuming you do hit it – they will only injure the bear and make it madder than it is already. Bear spray puts a cloud of the stinging, noxious spray between you and the bear. The “Carrying pistols . . .” link above also has a long, sometimes hysterical online discussion of the effectiveness of firearms vs. bear spray. My wife and I researched several glacier hikes, and one we wanted to do was a Grinnell Lake hike. We drove to the Many Glacier area, parked at the massive Many Glacier Hotel, which stretches down a long length of lakeshore on Swiftcurrent Lake. We took one tour boat to a dock at the opposite end of Swiftcurrent Lake, then hiked across a small isthmus, to catch a second tour boat to the opposite end of Lake Josephine. Taking these tour boats to lake shore trail heads can shave several miles off the total hike, if that appeals to you. In our case, there was no other option, since the lakeshore trails we bypassed had been closed due to intense bear activity along those trails. Sure enough, from the tour boat, we did watch one small bear gobbling berries on one of the closed trails. From the lakeshore trail head at Lake Josephine, it is an easy hike to Grinnell Lake. At Grinnell Lake, we watched a female moose and her calf browsing in the shallows at the opposite side of the lake. 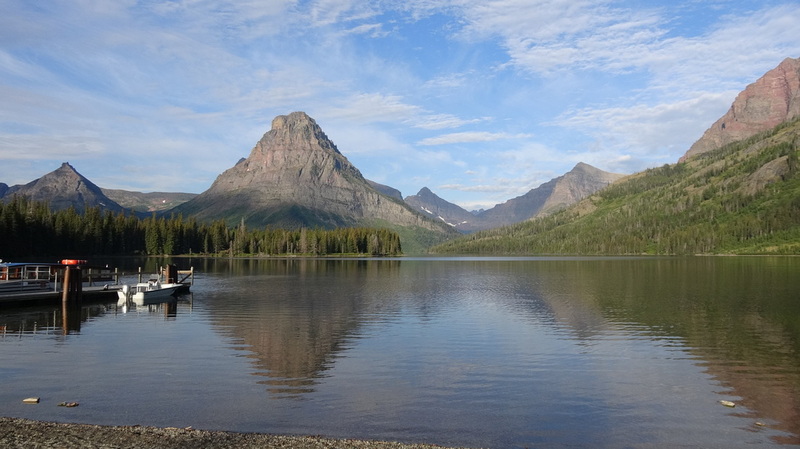 For those wanting a more severe challenge, the 5½ mile (one way) trail to Grinnell Glacier also begins at the Lake Josephine boat dock. This is a very strenuous hike, with some serious elevation gain, and your physical condition should be up to the trip before starting. As with all Glacier trails, inquire at a nearby ranger station about bear activity in your proposed area. ​For being in such a very remote area, Glacier is not difficult to get to. Those who prefer air travel can connect to Glacier Park International Airport, which is located between Kalispell, Montana and West Glacier, Montana. In addition, Amtrak serves both West Glacier and East Glacier. For most auto travelers though, Glacier is just a long, long drive. ​Born in North Central Texas, raised in Fort Worth. Spent childhood and youth summers camping with my parents all over the American West, with extra time spent in Yellowstone National Park. College summers spent working in Yellowstone Park. Started out career as high school science teacher, then moved to Shell Oil Company for 35-year career. 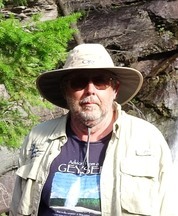 Married for almost 40 years to Carol, who I met while I worked in Yellowstone Park. We have one son. Have grown through all forms of camping: Backpacking, tenting, small pop-up camping trailer, and now large travel trailer. Enjoy church activities, reading, photography, camping, hiking, and road trips. If we can drive there, we prefer to – over flying, that is. One other hikers’ consideration in Glacier is bears. In general, bears will move out of hikers’ way if they know that the hikers are coming." Not only is there not enough room for parking: if you want to cruise the aisles looking for a space to open up, you have to wait your turn for that, too. "